Are you in the mood for some flavourful potato salad? 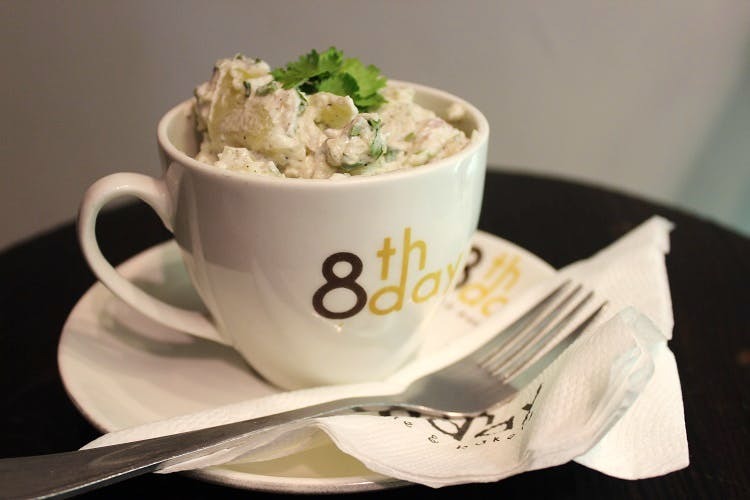 8th Day Cafe & Bakery will satisfy your craving in a jiffy with authentic potato salad developed by the owners who happen to be American expats. A perfect blend of herbs, seasonings, green chilies and cilantro, the creamy potato salad at 8th Day Cafe & Bakery will give you a taste of American summer picnics right here in Kolkata. I love the perfectly cooked potatoes, the slightly piquant dressing with the hit of green chillies. And the generous portion is priced at just INR 79. Pair it with a bagel and a lemon drop cookie, and you have yourself a hearty meal. Sit down with your bowl by one of the big windows and enjoy the art on the wall or pick up a book from their shelves. If you’re interested in serving potato salad at your next party, you can place an order for INR 200 per kilo, excluding taxes. 8th Day Cafe Has A New Milkshake Menu And We Can't Have Enough Of The Red Velvet One!